Construction of Cologne Cathedral began in 1248 and took, with interruptions, until 1880 to complete. It is 144.5 meters long, 86.5 m wide and its towers are approximately 157 m tall. The cathedral is one of the world's largest churches and the largest Gothic church in Northern Europe. For four years, 1880-84, it was the tallest structure in the world, until the completion of the Washington Monument. 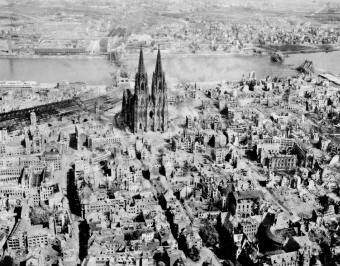 It has the second-tallest church spires, only surpassed by the single spire of Ulm Minster, completed 10 years later in 1890. Because of its enormous twin spires, it also presents the largest façade of any church in the world. The choir of the cathedral, measured between the piers, also holds the distinction of having the largest height to width ratio of any Medieval church, 3.6:1, exceeding even Beauvais Cathedral which has a slightly higher vault. 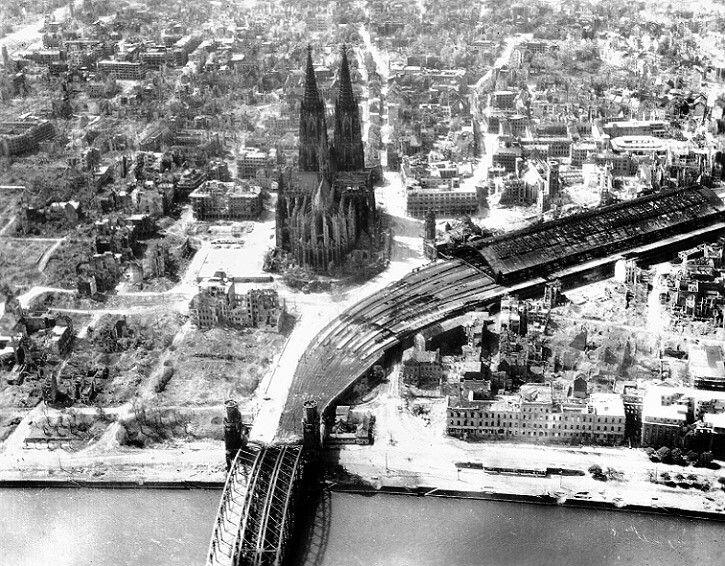 Cologne's medieval builders had planned a grand structure to house the reliquary of the Three Kings and fit its role as a place of worship of the Holy Roman Emperor. Despite having been left incomplete during the medieval period, Cologne Cathedral eventually became unified as "a masterpiece of exceptional intrinsic value" and "a powerful testimony to the strength and persistence of Christian belief in medieval and modern Europe". 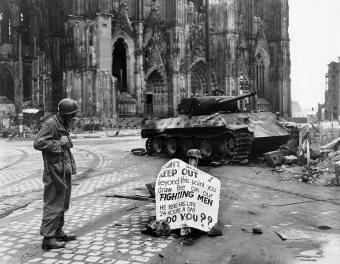 The cathedral suffered seventy hits by aerial bombs during World War II. It did not collapse, but stood tall in an otherwise flattened city. 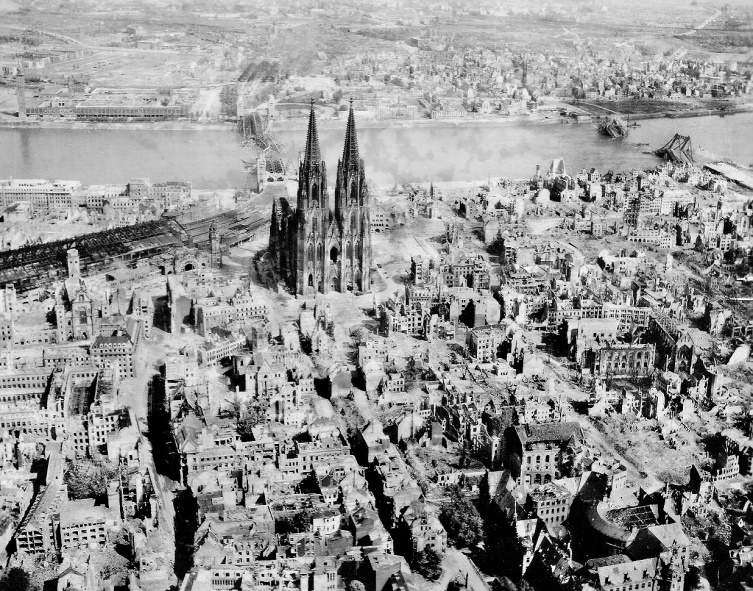 The great twin spires are said to have been used as an easily-recognizable navigational landmark by Allied aircraft raiding deeper into Germany in the later years of the war, which may be another reason the cathedral was not destroyed. The repairs to the building were completed in 1956. In the northwest tower's base, an emergency repair carried out in 1944 with bad-quality brick taken from a nearby war ruin remained visible until the late 1990s as a reminder of the War, but then it was decided to reconstruct this section according to the original appearance.